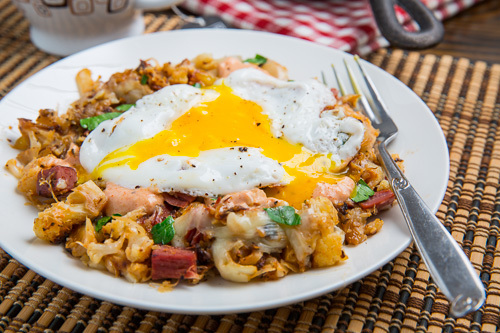 Leftover corned beef never had it so good in the reuben breakfast cauliflower hash topped with a fried egg. 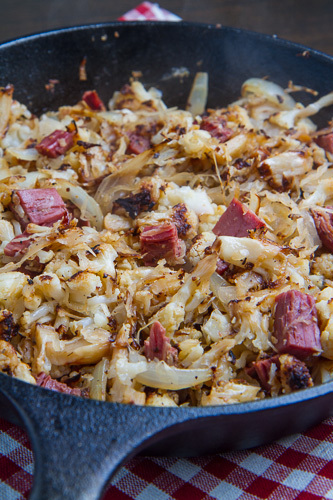 If you are lucky enough to still have any leftover corned beef , I have one more tasty way for you to enjoy it; in a reuben style corned beef and cauliflower hash. 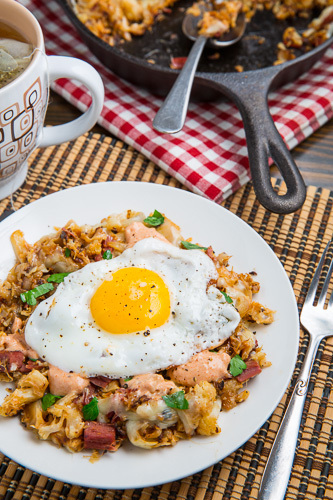 This hash has all of the flavours of a reuben sandwich including the corned beef, sauerkraut, melted swiss cheese, russian dressing and caraway seeds for the dark rye bread flavour. This dish could of course be done with the more common potatoes but I wanted to lighten it up a bit and went with cauliflower this time as it does amazingly well in hash! This might just be one of the easiest and tastiest ways to enjoy some leftover corned beef for breakfast! Start with some cauliflower and corned beef hash with sauerkraut, caraway seeds and russian dressing mixed in. Top with swiss cheese, place under the broiler to melt and enjoy topped with a fried egg with a runny yolk. Heat the oil in a pan over medium-high heat, add the onions and saute until tender, about 3-5 minutes. Add the corned beef cauliflower and sauerkraut, season with salt and pepper, spread everything out evenly, press them down and let them cook until they are nicely browned on the one side, flip and brown on the other side. Sprinkle on the cheese and broil until melted, about 1-3 minutes. Fry the eggs and serve on top of the corned beef hash with dressing to taste. That looks soooo good. 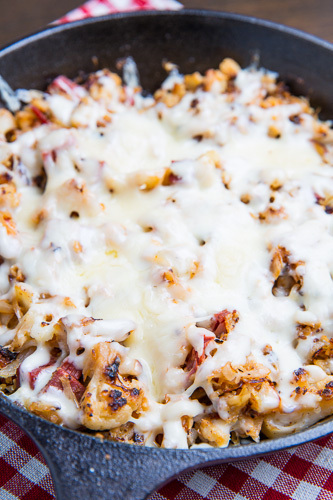 I would never have thought of using cauliflower in hash in a million years! Rocky Mountain Woman: Cauliflower works really well in hash!